Are crows actually scared of scarecrows? And it so, why? Even pigeons - the avian answer to telemarketing executives in terms of brainpower - can figure out the difference between a person and something flapping in the breeze, and crows are allegedly damned smart birds. How long does it take them to twig that the vaguely humanoid thing in the middle of the field isn't shouting and loosing buckshot at them? "Do you like them, Mr. Phillips? I made them myself. I'm ever so good at science, sir. Look! Molecular fringe animation, fashioned in the shape of straw men, sir. My own private army. Ever so clever, sir." He was a creepy bugger and no mistake - after and before being possessed by an alien. Not so much the scarecrows themselves, though, which was a bit of a turn up for the books. Normally when your otherworldly villain unleashes an army of creepy creatures in the direction of the human population, they're immune to pretty much any harm that gets slung their way, at least until the hero figures out some ingenious means of destroying them. I wouldn't have said "shoot them" was especially ingenious, so it's not much to the scarecrow army's credit that it worked fairly well. Still, I guess it would've been pretty incongruous to have an action figure of Son Of Mine without the other three members of his family - and Character Options presumably didn't want to tie up four slots in the third series of Doctor Who figures with characters from a single stand-alone story - so we get the scarecrow instead. He's a purposefully drab figure, since prior to his enforced enlistment with the Family of Blood he was just an ordinary scarecrow, of course, and it's not like they get posh clothes put on them. 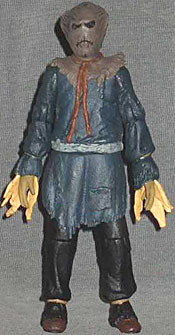 He stands 5¼" tall, average for the Doctor Who line, and wears a ratty old navy blue smock over black trousers and worn old boots bundled up with sackcloth. Straw pokes out of his sleeves around the hands, and his head is wrapped in a canvas sack, tied at the neck. The face is simple in the extreme, a stitched downward-pointed curve and two baleful eye sockets filled with dark fabric - I guess that's good enough for crows. The whole body has various bits and bobs of patch-up stitching and rumpled creases on it, but the head is where the most refined work is found: a subtle hessian texture fades in and out in patches, showing where the sack has worn down, and while the front is largely flat to show off its makeshift face, the rear has a realistic bunch of folds where it's been pulled tight into the neck cord, while the corners of the sack poke up at the top like ears. A well-judged drybrush of muddy brown over brown-black brings out the detail if you look for it, without being too polished-looking - it's just a sack, after all. The paint on the body is fairly flat, but for the most part good enough for its function. The "belt," a ragged cord tied around the waist, is drybrushed directly over the navy base, leaving it to show through just enough to bring out the texture without really revealing its blue colour - nice work. The string ties around the wrists and ankles, to keep the straw in, are only partially painted, but since the sculpt puts the ties deep in recesses it's difficult to spot the gaps unless you really pay attention. 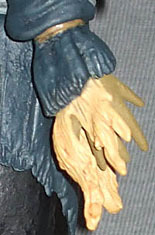 The straw around the hands is the only shortcoming: there's been what looks like a very light attempt at white-yellow highlighting over the yellow base, but it's not nearly strong enough, and the base colour remains too vibrant for the drab colours of the rest of the figure. Articulation is fairly standard for the Doctor Who range, with the crucial balljoint neck - especially necessary for this figure, since on screen they were always letting their heads loll sideways. 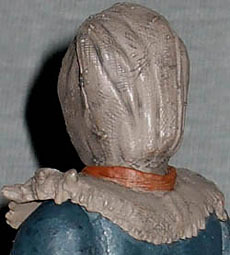 The shoulders, unfortunately, are swivel joints rather than balljoints - a shame, since the "collar" of the head sack would've partially concealed the joints - and the arms in general fare poorly, with only hinge elbows. The rest of the body works better, with a swivel waist beneath the smock's skirt - and the skirt itself able to turn independent of the legs - swivel/pin hips, pin knees, and swivel ankles. Given that the scarecrows just lurched about stiffly, the figure can do most everything it needs to do. There are no included accessories, but they never used any weapons of gadgets anyway, so it's not really an issue either way. In a line including the likes of Daleks, Cybermen, and Sontarans, not to mention eye-catching critters of newer vintage like the Clockwork Men and Judoon, it's easy to pass by the humble scarecrow - indeed, I wouldn't be surprised if he's the pegwarmer for this series. 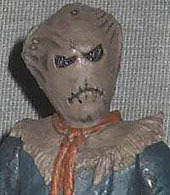 Still, if you want a scarecrow to commemorate the Human Nature/Family of Blood story, there's nothing wrong with it.